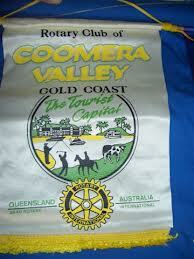 The Rotary Club of Coomera Valley was commenced in a similar way to the many clubs within District 9640. The Gold Coast Hinterland was expanding fast during the 1980s with large properties being divided up into hobby farms for those who wanted the convenience and enjoyment of Gold Coast living but also wanted the privacy and seclusion of country living. It was a time that development was thriving in the relatively new estate of Helensvale. It was also a time that newly elected District Governors discussed the potential of the Gold Coast to house more clubs. Existing clubs were asked to meet the challenge and charter new clubs. Past President Merv Howe of the Nerang Rotary Club was approached by District Governor Les Wilkins in 1986-87 and encouraged to ‘have a go’. Ultimately it was past District Governor Ron Burling and his chief assistant Lindsay Ruby of the Nerang Club who encouraged arranged an interest meeting. This was held on the 19 May 1987 at the Coomera Motor Inn. During May and June 1987 a recruitment drive was conducted in the Helensvale, Coomera, Oxenford, Pimpama and Hinterland areas to determine the interest and willingness of local residents to form a Rotary Club. The first interest meeting was held on the 19 May 1987. The establishment of the club moved quickly after a group of 15 interested men met on the 9 June 1987 and decided to form a club which would be called the Rotary Club of Coomera Valley. Of interest is that the name was agreed to with a majority of only one vote. The club was nearly called the Rotary Club of Coomera. Ron Burling and Lindsay Ruby of the Nerang Club suggested several interested members would be ideal office bearers for the new club. Ian Yarker (who would turn out to be one of our Districts most enthusiastic DGs) was nominated as the club’s first President. The clubs first magazine was issued on 23 June 1987 and boasted a club membership of 25. While the club did not have any women members it enjoyed hosting partners nights which the first being held on the 7 July 1987 only a week after it’s charter. Members wives (the Rotary Annes) would always support club activities making them not only enjoyable but profitable. The clubs first join meeting with it’s parent club Nerang was held on the 22 July 1987. Discussions were held in relation to the clubs big event - Charter night. The Rotary Club of Coomera Valley was chartered on the 30 June 1987 with a huge celebratory dinner on the 1 August at Dreamworld. President Ian Yarker accepted the clubs charter with 23 Charter members - three of whom are still with the Club today. It would be remiss of me not to mention these members - Road Peachey (PHF), Archie Shaw(PHF) and Terry O’Shea (PHF). 1988-1989 The Clubs first Raft Race at the lake in Siganto Park was held. 1990-1991 Exchange Student Andrea Nethercote of Canada was welcomed to the club and the Club organized it’s first community ANZAC ceremony. 1991-1992 Exchange Student Hideki Yamamoto of Japan arrived and the club meetings moved to the Recreation Club at Sanctuary Cove. 1992-1993 Exchange Student Chris Frisk of Sweden arrived. 1993-1994 Gayle Herd of South Africa arrived and ,Terry O’Shea and Rod Lane received the clubs first Paul Harris Fellows and the Helensvale and AB Interact Clubs where founded. It was also the year our community ANZAC Day ceremony included a March with 500 locals. 1994-1995 Exchange student Ezter Kroll of Hungary arrived and Geoff Munz became the first club GSE Team Leader traveling to Germany. 1995-1996 Exchange student Thomas Wagner of France arrived. 1996-1997 Exchange student Andri Wardhana of Indonesia arrived and a total of 15 new members were inducted in the space of 14 months. The Clubs first two females Kate Perkins and Justine Michel were inducted. 1997-1998 Exchange student Anna Zimmerman of Germany arrived. 1998-1999 Exchange students Jorge Bitelli of Brazil and Noora Kokko of Finland arrived. This is the first year two inbound exchange students were hosted by the club. 1999-2000 Exchange student Nutiya Nutsuri (Um) of Thailand arrived. 2000-2001 Exchange student Delphine from France arrived. This was also the year that the Nuemann Trust was established. The trust saw financial support provided to the club from Mr Bruce Nuemann (Nucruch). This year also saw the club support the establishment of a Community Youth Centre in the area. 2001-2002 Exchange student Ashley from Canada arrived. This year also saw the establishment of the clubs 3rd Interact Club at Coomera Anglican College. Our 2002 outbound exchange student to Denmark was Lauren McElhinney. 2002-2003 Exchange student Caroline Llhoest of Belgium arrived. 2003-2004 Exchange Student Rikard of Sweden arrived and this years ANZAC Day saw in excess of 2000 local residence march and participate in the ceremony. 2006-2007 Inbound YEP student Paola Lopez Hernandez from Cancun, Mexico was hosted by our club and outbound student Ashleigh Luke went to Denmark. The club hosted a GSE from Austria- Odi, Markus, Daniela, Romana and Andrea. 2007 – 2008 Second time Presidency for Des Lacy who was also selected to lead the first GSE team from Australia to the Middle East. The first for the club included our first official Sergeant at Arms elected (Rod Harmer); the first time the club recycled a President; the first time the club had a GSE team member and GSE team leader chosen to participate in a district Group Study Exchange (GSE); first time in ten years we relocated our meeting venue. The club welcomed Malcolm Cummings as a new member along with Ian Mayfield and James Leverria. 2008 – 2009 YEP Inbound shared with Nerang- Carlo Scotini from Brazil and outbounders Anita Knight and Zeph The to Brazil. Strengthened Carols and made it an annual event. Membership 25. Member Peter Davidson participated in Friendship exchange to District 1860 France. Interact at Upper Coomera, AB Paterson and Saint Stephens College. Dilemmas Competition held at AB Paterson. 2009 – 2010 Coomera Hub Project lead by Archie Shaw- rebuild the old Baumann House at Upper Coomera for $100k. House used by community groups and run by the Oxenford and Coomera Community Youth Centre. Club disperses over $40,000 to the community. Club purchases a bus for community use funded by Stocklands and contributions from CYC and Rotary. 2013 – 2014 Commencement of the establishment of the Oxenford Mens Shed. 2014 - 2015 Supported the inaugural "First night a the Proms" event and hosted six recipients for the "Pride of Workmanship Awards"
2015 - 2016 A year of excellent speakers including two multi-club nights at the Arundle Hills Country Club. Membership increased by 3 and we held our first Masquerade Ball.